Livestream a new set of media partnerships and ads offerings designed to meet the unique needs of mobile app marketers. For app developers looking to drive installs and engagement, it’s critical to understand the effectiveness of various media partners and placements. That’s why we have been investing in solutions to help developers apply consistent measures across a fragmented ecosystem of ad networks, and understand the quality of users that each delivers. Google Analytics for Apps provides an industry-leading solution for in-app analytics that is increasingly benefiting advertisers as they seek more transparency into ad effectiveness across networks. You can already use Google Analytics to track the performance of your mobile app install campaigns and understand the lifetime value of your users on both Android and iOS. As of today, we’ve built partnerships with 20+ ad networks including InMobi and Millennial Media since launching iOS conversion tracking late last year. Data integration with these partners provides a comprehensive view of app value across networks based on the metrics developers care about (i.e., LTV and retention), helping you make better decisions on where to spend your advertising dollars. In the next few months, you’ll be able to “postback” your conversions to referring networks in order to optimize your traffic -- all made possible with a single SDK. And it's not just about our measurement solutions. We recognize that developers should have choices when it comes to attribution vendors, and are committed to open solutions for the industry. That’s why we also announced the ability to integrate app install and event data from key third party measurement partners into AdWords. Working with third parties, including Adjust, Appsflyer, Apsalar, Kochava, and Tune, we are able to increase measurement accuracy between different trackers in AdWords, ensuring your data is accurate and reliable. By partnering with these leading ad platforms and tracking systems, we believe we can make the entire mobile apps ecosystem stronger and more connected -- all with the goal of making developers more successful. For developers looking to promote their app, we offer a variety of placements across Google Search, the AdMob network, mobile sites, and YouTube. 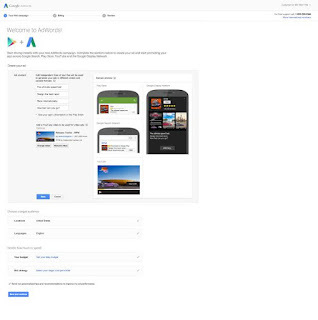 And earlier this year, we announced Search Ads on Google Play. By showing ads alongside app search results, you can reach consumers right when they’re looking for a new app, at the moment they are ready to install. Today we announced Universal App Campaigns, a new campaign type that allows advertisers to reach consumers across Google media more efficiently and effectively. Universal App Campaigns offers a simple way to set up install ads for your Android apps in AdWords or directly from the Google Play Developer Console. With a single campaign, you can scale your reach across Google Search, the AdMob network, mobile sites, YouTube and Google Play. Just provide us with a few inputs about your app — what your ad creative will say, the audience you wish to reach, and how much you want to spend — we’ll do the rest for you. Behind the scenes, our ad creation and bidding engines will help maximize performance for your campaigns so you can spend more time building and enhancing your apps. 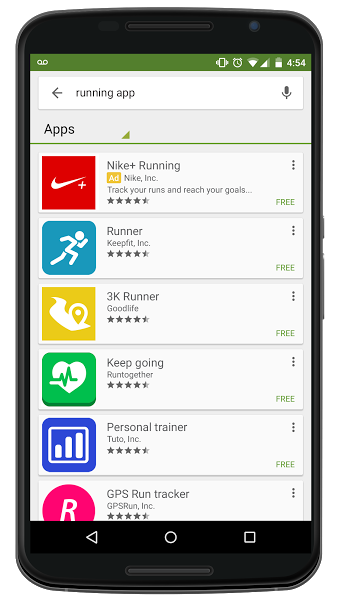 Search Ads on Google Play and Universal App Campaigns will be rolled out to developers and advertisers in the coming months. Today at I/O we also announced solutions to help you develop apps, engage users organically, and earn more money from your app. Our innovations in analytics and ads are designed to complement these offerings, and allow you to grow your business with measurement solutions that are open and reliable, and promotion tools that make ad buying easier and more effective. Thank you to all the developers out there who are building these experiences. We look forward to engaging with your apps and supporting your ongoing innovation by working closely with you and your partners in the ecosystem. As complexity increases in the app ecosystem, successful developers are looking for new ways to measure, manage, and optimize across multiple ad networks and operating systems. This morning, at our annual I/O conference, we announced via Livestream a new set of media partnerships and ads offerings designed to meet the unique needs of mobile app marketers.